We're talking about moons today - real, imagined or edible. Be sure to see the blue moon following the recipes. The first recipe is for a half moon fruit pie and it's wonderful for picnics, tailgating or events that require you to tote your food. I use apples to make these, but peaches, pears or berries could also be used. This is an easy, straight forward recipe. No special skills or equipment is required. I opt to use Golden Delicious apples in nearly all recipes that call for apples. Feel free to substitute your favorite, but make sure to use one that keeps it shape as it cooks. I dice the apples because I find them easier to work with than slices. If you prefer slices, go for it. This recipe will make sixteen 4-inch or eight 6-inch hand pies. You can make your own pastry or use ready made pie crust or puff pastry. You will, however, need enough pastry for a two crust pie. If you don't want to bake off all the pies, they can be frozen and used as your fancy strikes. Let's get to it. 1) Preheat oven to 425 degrees F. Grease and flour a large baking sheet. Set aside. 2) Combine both sugars, cornstarch, cinnamon, nutmeg and salt in a small saucepan. Add apples and lemon juice; toss to coat. Bring to a boil over medium heat, stirring constantly. Reduce heat; simmer, uncovered, for 4 to 5 or until apples are tender, stirring often. Remove from the heat. 3) Divide pastry into two sections. Roll each as for a 9-inch pie. Using a 4 or 6-inch round cutter, cut dough into 4 or 6-inch circles. Using a tablespoon if for 4-inch pies or a 1/4 cup measure for 6-inch pies, spoon filling into center of circle. Moisten edges with water, fold in half and crimp with tines of a fork. Place on prepared baking sheet. In a small bowl, beat egg yolks with milk. Generously brush half moons with glaze. 4) Bake on center rack of oven for 20 to 25 minutes, or until deep golden brown. These are best if served warm. Yield: 8 to 16 servings. Bread pudding really lends itself to improvisation. This recipe is simple family fare. We have fancier versions to share with you as the holidays approach, but this is perfect everyday fare. I use Golden Delicious apples and any stale bread I happen to have in the house. This pudding was made with Texas toast. We, of course, serve it with a drizzle of caramel syrup and a dollop of cream or scoop of ice cream. 1) Heat oven to 350 degrees F. Lightly grease an 11-3/4 x 7-1/2-inch baking dish. Toast bread slices lightly and cut diagonally into quarters. Arrange a single layer of bread pieces in bottom of dish. 2) Core and slice 1 apple; reserve. Core and dice remaining apples. Spread diced apples evenly over bread in dish; sprinkle raisins on top. Arrange remaining bread in two lengthwise rows over diced apples and raisins. Place reserved apple sliced between rows of bread. 3) In large bowl, combine milk, eggs, 1/2 cup brown sugar, butter, cinnamon, nutmeg, and salt; beat until well combined. Pour over bread and fruit; sprinkle top with remaining brown sugar and bake 40 to 45 minutes or until firm. Serve warm or cold. Photo by Kostian Iftica, courtesy of NASA, taken on July 2, 2004. In popular parlance, attributing something to a blue moon moon means that it seldom or rarely occurs. The moon shown in the photo above is blue because the photographer shot the image through a blue filter. Nonetheless, it was a blue moon and it is rare. What is a blue moon? There are two definitions. The most recent says that a blue moon is the second full moon in a calendar month. This can occur every 2-1/2 years on average. The other, older, definition says a blue moon is the third moon in a season that has 4 full moons. This last definition is important to the ecclesiastical calendar, which needs to know when the 13th moon is going to occur in order to stay on track and determine such things as the date of Easter and Passover. Are blue moons ever really blue? Probably not. The date of a full moon, all by itself, doesn't affect the moon's color, but volcanic activity can. Back in 1883 when the volcano Krakatoa exploded, the moon appeared to turn blue and stayed that way for years after the eruption. The particles in the ash cloud scattered particles in the visible light spectrum and allowed others to pass through, causing some objects to appear blue or green. More recently the eruptions of Mt. St. Helens and Mount Pinatubo have turned the moon blue as well. The key to having a blue moon is having lots of particles in the air that are slightly wider than the wavelength of red light. Volcanoes and forest fires can cause clouds that do that, so they can appear to be blue even if they're not. I don't want to get involved in the green cheese thing, so I'm going to move on. Hungry? Ah Mary, now I'm hungry again. Every time I come here I get so hungry. I should be in bed... it's 2;30 here. I always find such good recipes here! Today is no exception. And I have never heard an explanation for a "blue moon". So interesting! Bread puddings are one of my favorite things to make. It is such a great dish for using up stale baked goods. I am going to have to use your recipe for the half moon fruit pies. they look yummy! These recipes are perfect for fall,I especially like the Harvest Moon Apple Pudding.I just got a huge bag of apples from our neighbor's tree,I hope the recipe works on these apples,they are not quite as hardy as the baking type.Good info about the moon,and why it seems to turn blue. Love the info on the blue moon. Some of it I knew, some of it I didn't. Absolutely fascinating, but then I love our skies! Boy, does that half moon pie look good! Will certainly be giving those a try! Apple pie always my favourite. The half moon pie looks delicious and so is the other one...yum yum! I enjoyed your information on blue moons. Very interesting. I never knew anything about blue moons at all! The half moon apple pie looks great. I would love to try those. Yummy food as always and loved the blue moon! I follow the first theory . . .two fulls in a month! The information on the BLUE MOON is quite interesting. Thanks. I can't help wishing that I lived on your block so that you could run over and share some of your marvelous baked goods; they sure look yummy. Happy Blue Monday. Wow Mary I am impress you cook great...Thanks for the recipe I copied it hope you do not mind...I want to try it one day. TC Happy blue Monday! What a beautiful blue moon, it's got me humming the song...Blue Moon. As always you have a wonderful recipe to go with your great post. Now I'm hungry!! Nice pictures. I've never seen a blue moon. A real blue moon. What a shame :-( But I think I'd be happy with the edible ones LOL As always Mary, you serve the bet-yummy looking food. Love the blue moon photo!!! And bread pudding...my aunt used to make the BEST ever. I always thought I was being treated special by her when she'd make it for me as I was staying at her house overnight sometimes...Yum. And that moon pie...your photography of your creations just make me salivate so often [I should LOSE weight with all the water I lose, right? No luck tho!!] That one will be something I try in the future tho...scrumptious. Wow another delicious recipe for blue monday and the moon so attractive, and its hard to capture the color of the moon at night. Thanks for sharing delish recipe and information. Happy blue Monday! WOOhoo I didn't think I could get this hungry at 7:30am but you have proven me wrong. Have a blessed Monday. Oh my! The pie and bread pudding look absolutely delicious! Oh Mary you make my mouthn water all the time with your beautiful pictures and recipies. Thank you for sharing. I didn't know about the volcanic ash affecting the light spectrum - so interesting! I always get hungry when I visit you! ;-) I imagine other fruits could also be put in the half moon pies as well? My word verification for this post is "bownis" but - now that I'm hungry - I saw brownies! What good looking foods you shared. I am sure you have no trouble getting your family to the table. I would like to have your leftovers. I am someone with a sweet tooth so I love the recipe for the Half Moon Pies. I like the golden delicious for my apple recipes too. The info. on the blue moon is so interesting. Thank you for visiting my Blue's today. That is such interesting information about he moon! I did know about the 3nd full moon in a month, but I did not know about the seasonal moons. Your bread pudding looks divine! I may have to treat the guys in my house to this recipe. Thank you. Happy Blue MOnday. 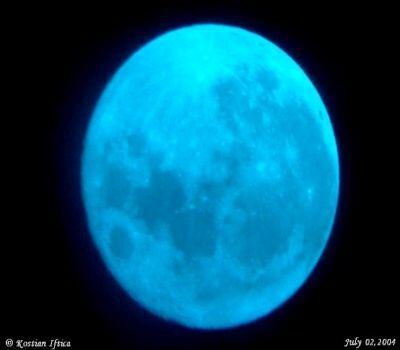 That was so interesting reading about the Blue Moon...I learned something new today. wow...interesting..
AND I love apple desserts..lovelovelove them. Did you see my Apple Walnut Raisin cake from last week? Your recipes look very delish and I love bread pudding too. I am going to try one of those very very soon. I learned a lot about blue moons; a lot of it i didn't know. The half moon pies and the pudding are talking to me! you have a good day and a good week too. Keep these good stories and delicious recipes coming. Ohhhh, your recipes sound delicious!! Love that blue moon, even if it is the result of a filter. Enjoyed reading your post. I am so hungry now, lol! Such a beautiful bread pudding... love the layers! Mmm... the pies and pudding look amazing. I love the golden crust on the pies. Thanks for the inforation on the blue moon. How did you know I picked 30 pounds of apples yesterday? Handpies are in my near future! Thanks Mary. And I didn't know about the blue moon. That was really interesting and I am off to google more. Interesting post, Mary. I don't think I've ever seen a blue moon. 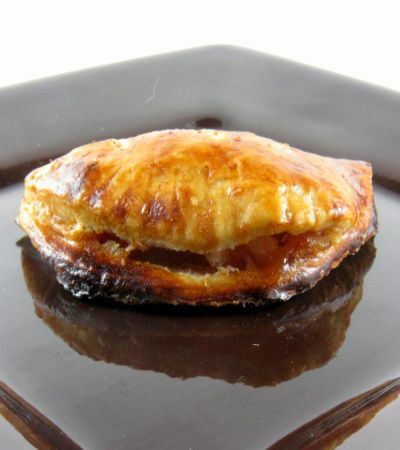 Your hand pies look delish. I brough some peaches home from the farmer's market and think I'll try them. Thanks. While after 5 hours of cleaning at MIL's house I'm ready to float down the rive in my blue canoe and enjoy a harvest moon pie...did you have any left? that pudding looks so decadent! YUMMM! i'm sitting in class and I WANT SOME! Now my mouth is watering!! Yummy looking post. Also the Blue moon info is interesting too. Some of that I had heard before, but forgotten. Thank your for your sweet comments on my Blue Monday post about our anniversary! Those look so cute & yummy! Gorgeous pic of the moon too! Have a great week, and thanks for the nice visit! I love, love. love apple desserts and these both look delicious. The blue moon info and photo are so interesting too--thanks for sharing! I guess I'm just a little behind on the Blue Monday party...eeek! Sorry! 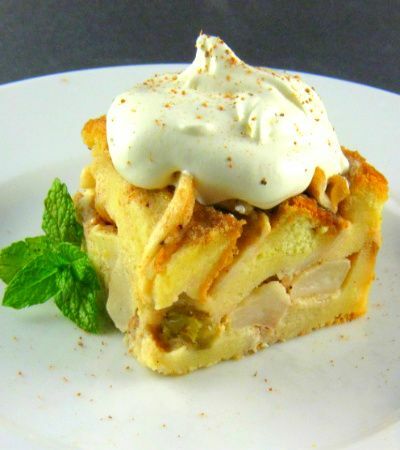 I love bread pudding, and this is an interesting variation of it. I like it moist though, so I think I might try it with a little more milk - though I hope without it collapsing! But it's a simple recipe with not that many ingredients involved that I wouldn't mind making more of it just to experiment with.